AccuShred is committed to providing our clients with the industry’s most secure containers in order to maintain the privacy of their sensitive information. 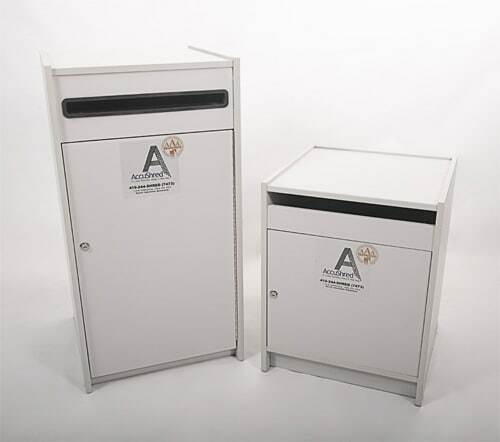 AccuShred’s secure containers are available in several sizes and styles. All containers are provided at no cost for scheduled service and include keys and padlocks for your control. If space is an issue in your office, AccuShred offers an Office Console. The console is an attractive premium grade, stain-resistant melamine cabinet with an edge-banded paper slot. The cabinet is front loading, which leaves the top available for office equipment. The cabinet opens from the front which makes removal of the double-stitched nylon bag easy. The console unit has nylon glides which protect the floor and comes in an attractive light gray color which blends well with any office setting. The office console is also available in a smaller, under-the-desk, version. The 96-gallon and 64-gallon containers are injection-molded from the highest quality plastic resin. These attractive containers are easily maneuverable and fit through narrow doorways. 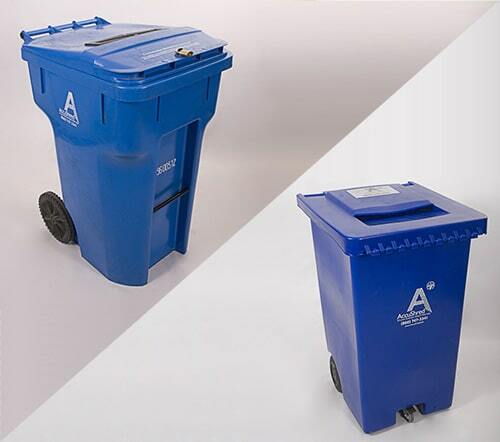 Durable and aesthetically pleasing in a royal blue color, these containers feature rubber wheels, reinforced lid with “fishguard” protection, and a slot with a molded-in security flap. 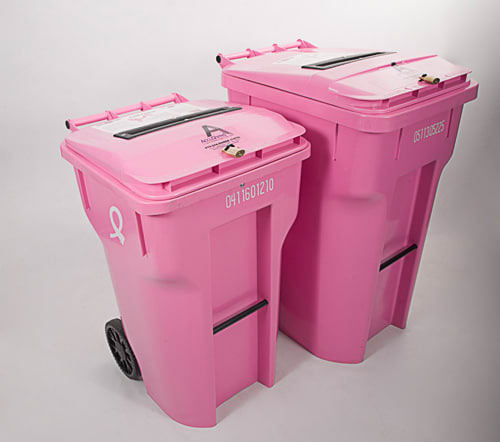 In addition to our blue containers, AccuShred also offers Pink Bins for our ShredCancer Program. These unique pink bins also come in 96 and 64-gallon sizes. For more information on the ShredCancer program, click here.